An update on this: to clarify something I obviously didn't previously, I'm not talking about letting up on criticism of Lonesome Rhodes' work here. I am talking about calling off the Baker Street Irregulars - while reserving the right to reactivate them. Trust me, I'm going after him tonight on the tweet to his masses that precipitated this, the "find out everything you can" about three Obama appointees. For those unfamiliar with the literary references, Lonesome Rhodes was Andy Griffith's character in the 1957 film "A Face in the Crowd." In it, he played a small town comedian that makes his way to radio, and eventually television only to destroy his career by insulting his viewers on the air. As for the Baker Street Irregulars, they were a group of street urchins who helped out Arthur Conan Doyle's Sherlock Holmes during some of his famous investigations. In the '40s, Drew Pearson used to close his radio broadcasts by noting how many times his rival Walter Winchell had mentioned himself in his radio broadcasts. Yet, all of this does raise an issue. Just because Fox and Beck have done this, do I want to? Do I want to, even for a moment, be Glenn Beck? I mean, I am risking at least three things he doesn't have: the respect of my peers, self-respect, and a conscience. The self-delusion on display is quite astounding, isn't it? 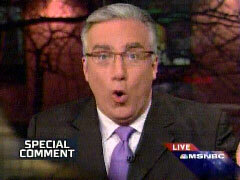 After all, one would be hard-pressed to find a real journalist that has any respect for Olbermann. As for a conscience, he's shown no signs of possessing such for years. With this in mind, there's likely a much different reason for Olbermann to call off his urchins, especially within hours of returning back to work. Exit question: Is this REALLY the kind of behavior General Electric accepts from such a high profile employee?